This post is inspired by the negative experience a good friend of mine had trying to get involved with the alumni board of her alma mater, a small college on the East Coast. She's made small gifts to her college a couple times in the few years since she graduated, but hasn't been otherwise engaged. Reunions don't appeal to her since she's only a few years out, and she hasn't been interested in the alumni events held in her area. The alumni board, she feels, is a more substantive way to get involved. She tells me that the first time she looked for information on getting involved with the board, the alumni office's web page contained out-of-date information for the prior year. When she emailed the office to get current information, the alumni relations team told her that the deadline for nominations to the board had already passed, but that they would add her to the list of interested alumni and contact her the following cycle. A couple months ago, my friend realized a year had passed since then and followed up by email. Her alma mater's alumni team and the alumni board's outreach committee had forgotten to contact her when the nomination process began, and she missed out again. This is only one example at one institution—your process for educating alumni about how they can get involved with their alumni board or alumni association may be watertight. But in all the engagement opportunities you offer alumni, there are bound to be some leaks, cracks that interested alumni fall through even when they try to remain engaged. There are two reasons we should focus on patching leaks first. One, we get higher returns on our effort by patching these leaks than we do trying to design entirely new programs. And two, these leaks affect participation in and access to our core programs and offerings. These leaks can occur at any stage of the engagement process, visualized here as an engagement funnel. 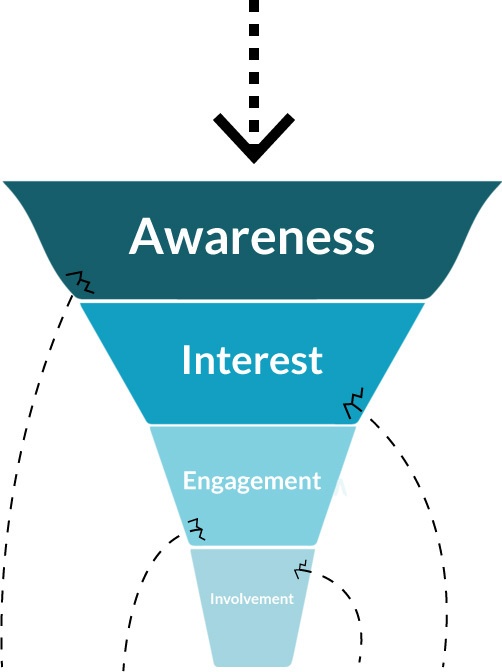 Some examples: A leak in the awareness stage of the funnel might occur because of a lack of readily available information about a given program. Interested alumni might fall through the cracks because the information is there but out-of-date. Engaged alumni might stop engaging when they don't get a thank you or recognition for their contribution. And alumni who want to be involved might try to but fail simply because, like my friend in the example above, they don't get an email back. Patching these leaks is just like patching physical leaks. You turn the water on and find the drip. In the tech world, this is called mapping the user's journey. Mapping our alumni's journey puts us in their shoes and opens our eyes to the obstacles they experience in their relationship with their alma mater. Take this alumni journey map as an example. It briefly maps the experience of an alumna who receives (or doesn't) an email from her alumni office announcing a new volunteer program. Of course, we reach alumni across multiple communications channels, and not every exit from the flowchart here is necessarily a "leak." (We will never get 100% conversion.) But if we map multiple channels, multiple example experiences, we will find gaps we can fill. Making the call to action front and center in our announcement email will drive clicks. We can make the sign up form easy to find, and we don't have to put it behind an alumni login wall. We can keep the sign up for short, and send repeated follow up emails if someone doesn't get back to us the first time. The gaps that shouldn't be gaps are leaks. None of this is new to us, but it is all too easy to forget that our existing processes sometimes spring leaks without our noticing, and that there are plenty of leaks we can't see. My friend, the young alumna, isn't unengaged because young alumni are a strange species of alumni that require special handling. She's unengaged because her alma mater never emailed her back. Starting new programs asks more of our time and attention than fixing old ones. And if our current programs are leaking, we can add as many people to the top of the engagement funnel as we want only to see them slip away. So in 2018, let's resolve to fix the leaks in our ships before we look for bigger boats.